After years of scoring poorly on speed tests while protecting users' PCs, Symantec believes it has finally got the product right by adding a whole host of new features to boost scan speeds and malware recognition. Among the new improvements include a much faster one minute install, which apparently has been a bugbear for many users in the past when experiencing install times of up to 10 minutes. This new feature is one to upset the privacy lovers out there, sending info about individual scans to other users in the community. 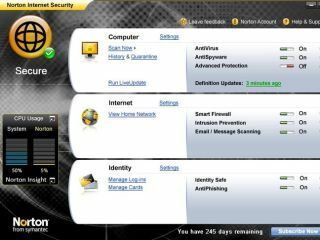 For instance, if you launch the new Google Chrome browser or fire up iTunes, then Norton will scan it, and find it clean. It will then share that info with other users, so when they fire up Google Chrome they won't be subjected to the scan slowdown. Extrapolate that over a huge number of common programs, and suddenly your PC will only need to scan one in 10 files, speeding things up dramatically. That means files can be divided up into those Norton trusts, the Community at large trusts, or those needed to be scanned. Easy when you think about it, and we're told, totally anonymous. Another problem Norton users have faced in the past is the stupid pop-up, telling you that it needs to scan just when you're about to do something important, like present to the board or watch an adult 'art' movie before your partner gets home. The new products wait until the system is idle for ten minutes before starting a scan, so tries to flick through its to-do list while you're on the toilet or making a sandwich, shutting down the non-essential parts when you return. It also switches to 'silent mode' when going full screen, so when it detects a game, movie or presentation, it will hover in the background, waiting for you to finish like a scary drunk uncle at a party. Symantec is also offering free telephone support with all its new products, including the phone this time. Where before you could chat online or email, now you can chat ON THE PHONE. We really do live in a technological age of wonderment. Other than that, it's got the best ever stats of a Norton product (until next year, that is). The lowest false positives of any product, 99 per cent virus detection and high update levels over a month, place it as class leader in many categories. But, as with most software, it can only talk the talk for so long. TechRadar will be sniffing round for a review as soon as possible, and we'll let you know if the new Norton really is as fast and spiffy as it says it is.